She lived her life with courage, openness and celebration, navigating around the paradoxes which were part of who she was, never allowing challenges to limit or define her. The Brook Catherine Doseger Endowment Fund, initiated by Catherine and Greg Bell and administered by the Community Foundation for Kingston and Area, will make possible an annual grant that will be disbursed by the H’art Centre of Smiles to a post-secondary placement student who best exemplifies the philosophy, aims and joys of the H’art Centre in its work with people with developmental and physical disabilities. Brook was born and raised in Kingston. Her lifelong dream to be an elementary school teacher was realized when she graduated from Nipissing University’s Concurrent Degree Program with a Bachelor of Education Degree from the Schulich School of Education, and immediately secured her first kindergarten teaching position at a private English-immersion school in Kuwait City. Six weeks later while crossing a street, Brook was hit by a car and died instantly. For Brook, showing kindness and generosity were more than nice things to do when you felt like it. They were the guiding principles that led her to make a difference in the world as a daughter, sister, granddaughter, niece, cousin, teacher and friend. She learned these lessons very early from her parents who daily practice street-level philanthropy here in Kingston. Brook was a person of faith – living her beliefs, rather than just talking about them. Her passion for life and adventure knew no bounds, overflowing into everything that she did, including volunteering and celebrating with people with developmental and physical disabilities, talking openly about mental health issues, and supporting initiatives to increase childhood literacy. This fund provides a permanent legacy for Brook, supporting a cause that she was passionate about. 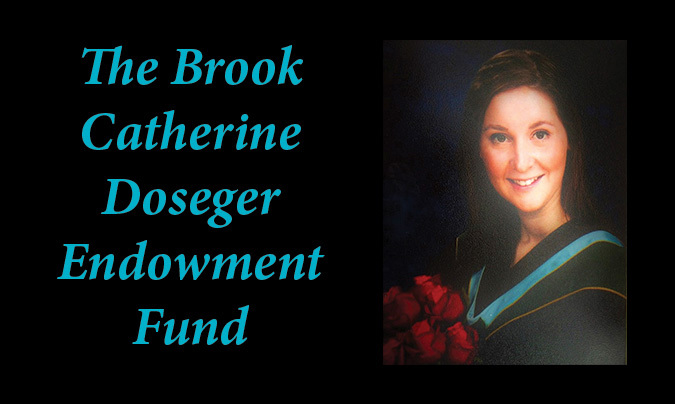 If you would like to donate to The Brook Catherine Doseger Endowment Fund, please click here. If this story inspires you to learn about how you could Create Your Own Fund, please click here.